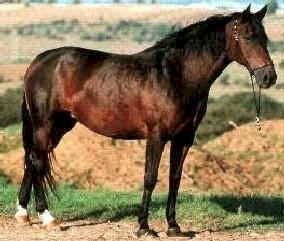 Anglo-Arab-Sardo, or Anglo-Arab Sardinian, horses originated in Sardinia, Italy. When the Saracens dominated the island of Sardinia, Arab stallions had been crossed with Sardinian mares of smaller size. At the beginning of the 16th century those horse were used for crosses with Andalucian stallions. In the course of the nineteenth century, thanks to the introduction of English thoroughbreds (thus, the prefix "Anglo"). Modern day Anglo-Arabo-Sardohorses are quite different from those of the past. Like the French and American Anglo-Arab horses the Sardian Anglo-Arabs have obtaining excellent results as show jumpers and as a race horse. They are a saddle horse and light draught animal with a noble bearing.